Welcome to Georgia’s Stained Glass Werks a family owned business for over 35 years. Our mission is to meet all your stained glass needs. We specialize in Residential/Commercial Stained Glass Restoration and Fabrication. All our work from design to fabrication is completed in our Morris County Studio on the beautiful Rockaway River. Our showroom is full of wonderful ideas and gifts alike. We will also take special care of your treasures in need of repair. Stained glass artist and restoration specialist, Bonnie Hook, has been designing, restoring and fabricating for over 30 years. In addition to collaborating with fine artists, interpreting and translating their designs into a “glass canvas,” Hook executes her own design for private clients and institutions. Known for her signature hand-designed style as well as for her curated glass selection, Hook is also trained in the fine art of glass painting. 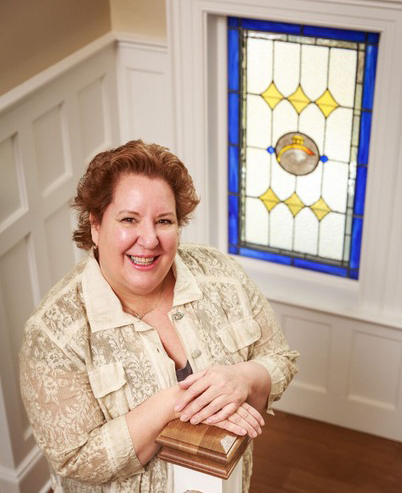 Her design work includes original custom windows, cabinetry, and entryways. In addition to private homes, her work can be seen in installations and sanctuaries throughout the tri-state area, such as the Picatinny Arsenal Chapel and the First Memorial Presbyterian Church (both in Dover), St. John’s Episcopal Church in Boonton, Hackettstown Hospital, and the Baltusrol Golf Club in Springfield. Hook’s commitment to creating and preserving history is evident in a portfolio that includes restoration of original work by Louis Comfort Tiffany, Benjamin Sellers, and Frank Lloyd Wright. Hook has taught classes in stained glass, lectures on the art of stained glass restoration, and owns Georgia’s Stained Glass Werks in Rockaway, NJ, a business she developed with her late mother, stained glass artist Georgia Van De Velde. Stained Glass fabrication and restoration is an art form with a language all its own. The studio’s extensive experience in every aspect of the process allows us to provide our clients with the best possible service.